A database event is a task that runs according to a schedule. 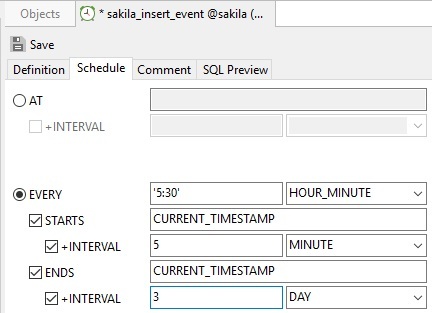 Also known as "scheduled events", an event is similar to a cron job in UNIX or a task scheduler task in Windows, except that scheduled events are configured using a database's syntax and/or command-line-interface (CLI). Database events have many uses, such as optimizing database tables, cleaning up logs, archiving data, or generating complex reports during off-peak time. 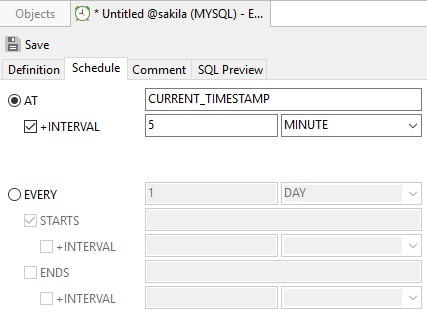 In previous blogs on this topic, we learned how to configure events using MySQL as our database. 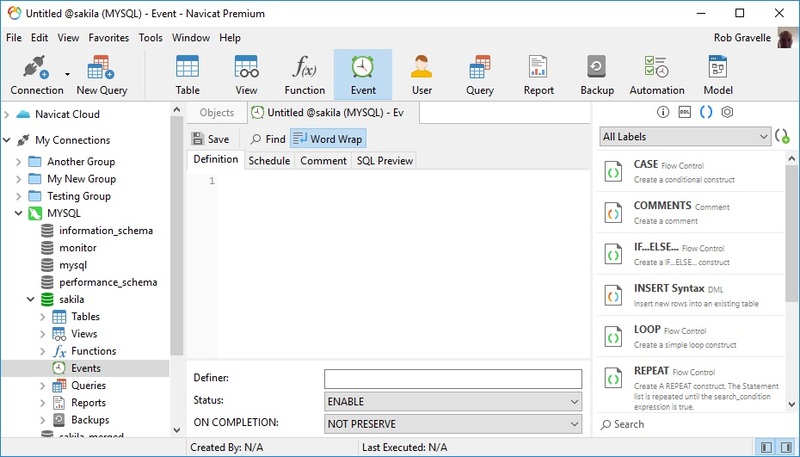 Today, we're going to schedule a database task using the Navicat Premium GUI Database Management Tool. Clicking the Event button opens the Event object list in the Object pane. The Object pane toolbar contains three buttons: Design Event, New Event, and Delete Event. If you have no events defined, only the New Event button will be enabled. You can enter any valid SQL procedure statement in the Definition tab. This can be a simple statement such as "INSERT INTO tbl_users (first_name,last_name) VALUES('Bob','Jones');", or it can be a compound statement written within BEGIN and END statement delimiters. Compound statements can contain declarations, loops, and other control structure statements. Note that we don't have to write the CREATE EVENT code, as this is handled by Navicat (as we'll see in the following sections). Note that the statement is read-only and cannot be edited in the preview. You can include comments with your Event on the Comment tab. To modify an Event, select it in the Object tab and click the Design Event button. That will open it in the Event tab.